BURBANK, California – September 20, 2018 – Printograph, Inc dba GotPrint.com has received the coveted 2018 Benjamin Franklin “Benny” Award for the Digital Enhancement Printing category. The winning work is an annual booklet called the Broker’s Product List (BPL). Their 2017 edition of the BPL was also a Benny Award winner last year. 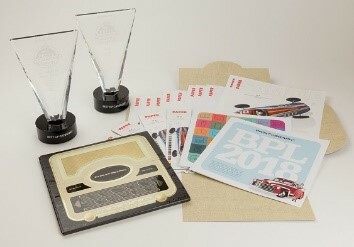 Both awards were achieved after GotPrint.com installed a Scodix Ultra Pro with Foil in early 2017. “Every year, since 2009, Printograph has produced the BPL. It’s designed specifically for the print professional [print broker and reseller customers as well as other print industry leaders], demonstrating not only what we offer in terms of product and paper, but exhibiting the quality, uniqueness, and level of customization our company can achieve with our high-end equipment,” notes Erina Sookiasian, Marketing Project Manager. “We’ve been accentuating projects with the Scodix system for about 18 months now and it continues to deliver that ‘wow factor’ that clients crave,” notes Ardash Der Derian, VP of Manufacturing. “Our clients love the specialty finish the Scodix systems offer. We have quotes and orders coming in daily with amazing and unique projects and designs. Most of our clients request packaging orders with the high-end foil finish. GotPrint started out as a small, family-run business in Toluca Lake, California, with a goal that would soon become a tradition: to provide fast, economical, and convenient service without sacrificing quality. In no time at all, this steadfast tradition helped them evolve into a continually growing and dependable company. Since then, GotPrint moved its headquarters to San Fernando Rd. in Burbank, encompassing about 130,000 square feet, and opened additional facilities in Kentucky and Texas plus an international location in India.